It seems like everybody wants to jump into a hybrid workout right after buying P90X. I get why you would want to but I recommend against it. After doing four rounds of P90X my experience is you have to give the program a chance to work for you to see results. 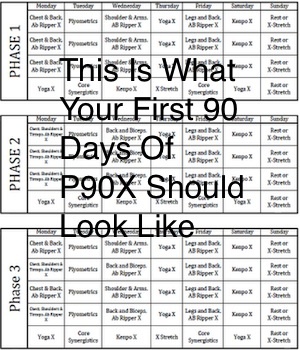 If you go picking and choosing what workouts you want to do with P90X you’ll never get to the mastery phase. This is important because it’s when your body starts to understand the moves. You’ll be able to start pushing even harder from this point moving forward. Here are some tips for those people who want to do other workouts. Already A Gym Rat? – Skip the gym for 90 – 100 days and do the entire P90X program at home or bring the DVDs to the gym. If you don’t like the results after the 90 days then you can go back to what you were doing before. My buddy Brad was in awesome shape before P90X and got even more ripped. He said his bench press went up by 5 pounds his first time trying it in 3 months. He catches himself doing many P90X moves at the gym. Extreme Athlete? – I’m not an expert on this and can only assume that triathletes and marathoners use the off-season to recover. If your one of the people who only do 1 or a couple of them a year then plan a 90 day period with no event specific training and do P90X. You’ll be surprised how much more fit you are from head to toe the first time you go out for a run, bike, or swim. Play Sports? – Make P90X a priority to do in the off-season. It will work on your weaknesses so you’ll be ready to get at the sports specific workouts when the season comes around. If you like the results then stick with it. I seem to be having games all the time and I like to schedule Yoga or a stretching workout on game day. Sometimes I don’t workout that day and just play. They key is I stick with the workout plan and mix game days around it. From my experience I would recommend seeing P90X all the way through before trying to do hybrid workouts. It will take you much longer to see results or any at all if you mix. The goal is to treat the P90X workout like the challenging program it is. The only way to do this is to follow the program for the entire 90 days.